For the first time ever, Ghana’s political parties are campaigning hard in the northern regions where development has increased political empowerment. 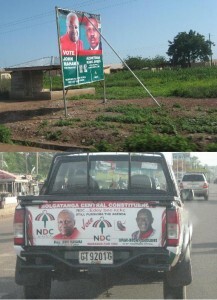 Oct 29, 2012, Tamale, Ghana – I have been in Tamale, the northern capital of Ghana, for over two weeks now. My work at Canadian Feed The Children inspired me to take a trip of my own, and for the past two weeks I have volunteered as a teacher at a local girls’ school. The experience has been amazing, and I am now excited to spend a few days with our CFTC field office here in Ghana and with our local partners. Today I was picked up bright and early by our Country Representative, Chrys Anab. As we wove our way through the motorbikes, pedestrians and goats that seem to be permanent fixtures on the streets of Tamale, I couldn’t help but notice the many political signs and posters that are plastered around this bustling town. Ghana is headed towards both presidential and regional elections on December 7, and it is a hot topic of conversation among Ghanaians. Even more so here in Tamale, as all presidential candidates will be converging in the city for a televised debate later this week. You can tell by the added congestion in the streets and parade of motorbikes with riders holding signs for the candidate of choice. The race is too close to call at this point, but the two main competing parties are the National Democratic Congress (NDC), which is the ruling party and the New Patriotic Party (NPP). I am told that the Northern Region of Ghana tends to vote NDC, as the past few years of NDC government has brought important development initiatives to the impoverished north, and the citizens here are eager for further developments. But what sparks even more hope among citizens of the north is the fact that all parties are campaigning here in the Northern Region – which is something that rarely used to happen. With Augustine N-Yokun, Program Officer, in CFTC’s Tamale office. Upon arriving at the CFTC field office in Tamale, I received a full (!) tour: the office consists of the Country Representative’s office, an office for the Program Officer, and a bathroom. A humble abode – but it’s all we need to support our two main partners in Ghana: the Regional Advisory Information and Network Service (RAINS) and TradeAID. CFTC shares a building with Savannah Farmers, an organization that links local farmers with buyers and ensures they receive fair pricing for their crops and goods. Sharing the space means that CFTC shares the costs of security, Internet and electricity – a smart way for a non-profit to operate! The majority of the day is spent being debriefed on the work of RAINS and TradeAID. It is great to have this time to ask questions, and gain clarity on CFTC’s relationship and programs with both organizations. The road I followed each day to teach at the girls’ school. I spend time arranging my flight to Accra later in the afternoon, and travel to three different locations until we find a travel office with working Internet and power. I’ve learned from personal experience that power and Internet outages are quite common here in Northern Ghana. 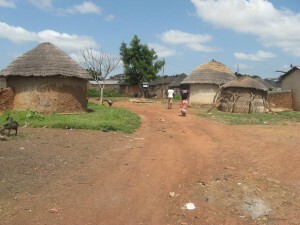 Tomorrow I am off for the two-hour drive to Bolgatanga to visit CFTC partner TradeAID. They run the amazing basketweavers’ co-op and craft centre. Having admired their gorgeous baskets (they decorate our offices back at home in Toronto), I can’t wait to see how they create these intricate and gorgeous designs in person. More to come on that experience tomorrow!